The Recipe Girl: Daring Baker's Challenge: Pizza 3 ways... Breakfast, Dinner and Happy Hour! 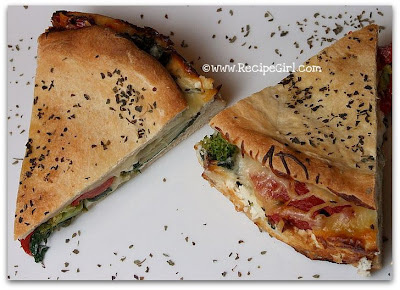 Daring Baker's Challenge: Pizza 3 ways... Breakfast, Dinner and Happy Hour! This month's Daring Baker challenge involved experimenting with the Basic Pizza Dough from Peter Reinhart's The Bread Baker's Apprentice. It was a fun challenge, and my family enjoyed the month-long pizza recipe trials. Since I already have a go-to pizza crust recipe that is very simple, I found the directions for this one to be rather long and overwhelming. That being said, I trudged through and was actually happy with the results. The recipe turns out 6 balls of dough that can be frozen to make whenever the pizza-mood strikes. Since we like our crust a little on the thick side, I separated my dough into 3 portions instead. The dough is meant to sit in the refrigerator overnight. 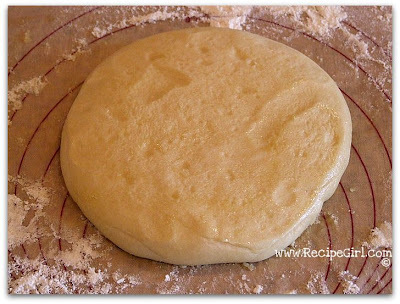 The following day, you take a ball of dough out of the fridge and flatten it into a 5-inch circle to rest for 2 hours. 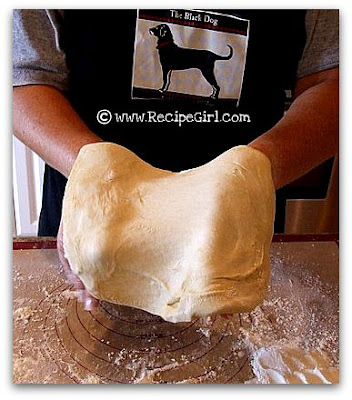 The dough then becomes pliable and relaxed enough to stretch out gently on the tops of your hands. And then you begin tossing it into the air until it's stretched out into the desired size and shape for your pizza. This was the fun part. 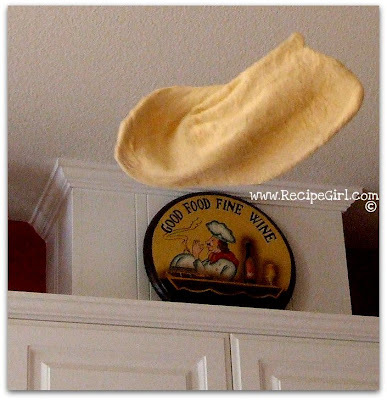 The whole family cracked up as I frantically tried to catch the dough that I had tossed high into the air. It really did work. The dough stretched out nicely as it was tossed, forming the shape needed for my pizza. There's a deli near our house that serves up Scrambled Egg Pizza in the mornings. It's fabulous, so I attempted to replicate it with this Sausage and Scrambled Egg Pizza. It wasn't an exact match, but it was fabulous nonetheless. 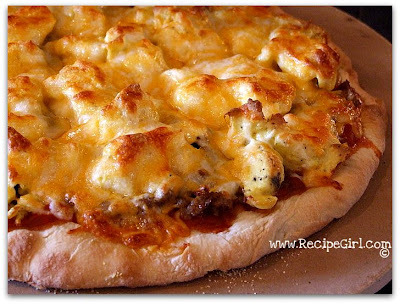 Chunky salsa acts as the sauce on this pizza, and then it's topped with crumbled sausage, lightly scrambled eggs and cheese. Sour cream is scooped on top of each slice. It made for a terrific brunch on a Sunday morning. Grilling pizza has been on my list of things to do for a long time now. I always thought the dough would stick to the grill and be a big mess, and that it would be too much trouble. Not the case here- it didn't stick at all. 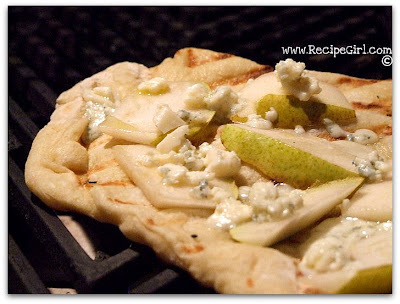 This dough worked great on the grill for Blue Cheese and Pear Pizza. The dough is tossed onto the lightly greased grill for a couple of minutes, brushed with olive oil and then flipped and brushed again. I split the dough in two to create a couple of smaller pizzas. A simple layer of sliced ripe pears and a sprinkle of blue cheese given time for a quick melt, and this was an excellent Happy Hour treat to accompany chilled white wine. Since I had separated my dough into larger portions, I had more dough to play with for this one. 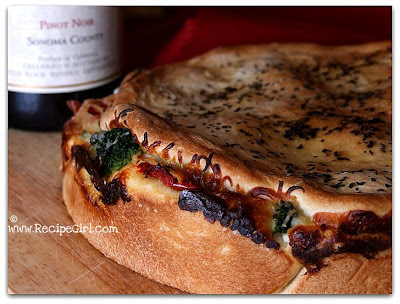 I opted to create a pizza pie inspired by one I had seen on Picky Palate: Ricotta and Vegetable Stuffed Pizza Pie. 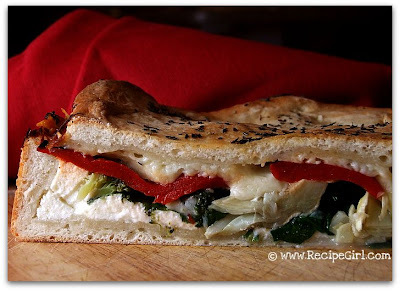 The dough is pressed into the bottom of a springform pan, and topped with ricotta, desired veggies and cheese. It's then topped with another layer of pizza dough and baked into a pie. The result is similar to a calzone. The slices cut very cleanly. We topped ours with a bit of marinara sauce while my little guy opted for a spoonful of Ranch dressing. This was one delicious dinner! My thoughts about this crust recipe? It was really excellent. And I liked having dough in the freezer that I could take out to make for a quick dinner. I'm quite attached to my go-to crust recipe, which is a Whole Wheat Pizza Dough, but I might still opt to make this one once in a while. Thank you to Rosa's Yummy Yums for hosting this month's challenge.